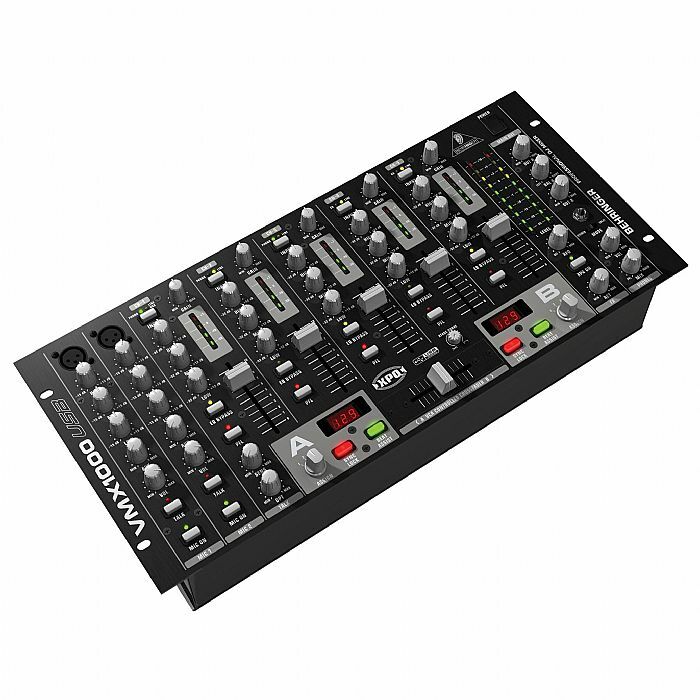 BEHRINGER Behringer VMX1000 USB 7 Channel Rackmount DJ Mixer vinyl at Juno Records. Lines open in 7 hrs 34 mins. The VMX100 offers two dual input stereo channels for connection of up to four stereo sources, selectable on the top panel. A basic ULN mic input with level control is also provided. Each stereo channel sports a great-sounding 2 band kill EQ with 32 dB of attenuation and a 45mm Ultraglide fader. The PFL section features a channel 1/ channel 2 balance control, while the main section is equipped with a dual 10-segment LED level meter, which displays your choice of main or PFL signals, as well as stereo main mix and tape outputs.